SmartZone™ controllers are available in a 2-zone economy model, a 2-zone full-featured model and a 4-zone full featured model. 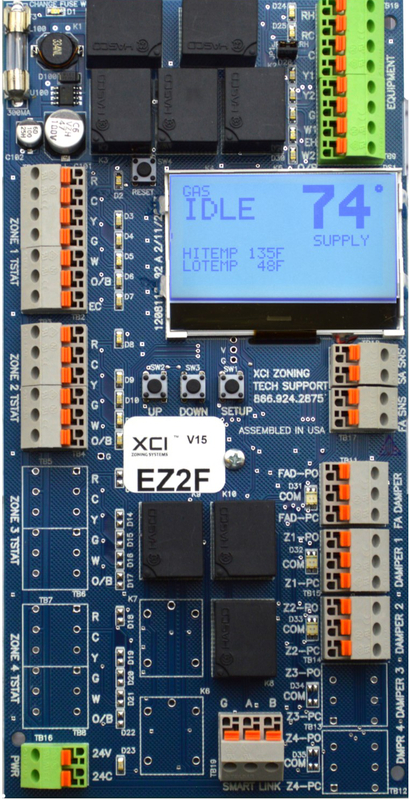 The EZ2F and EZ4F can be used as expansion modules for up to a total of 40 zones. The EZ2N will accommodate gas/electric, electric/electric, and heat pump. The EZ2F and EZ4F will accomodate gas/electric, electric/electric, heat pump and dual fuel heat pump systems. SmartZone™ controls single stage, two stage or three heat/two cool heat pump systems using single stage thermostats. Staging is based on time and the temperature of supply air. Supply air temperature is displayed constantly. Also, LED’s indicate what calls are coming in, what dampers are open and what call is being placed to the equipment. Screwless terminal connections are fast and easy. A lighted LCD display shows full system information.